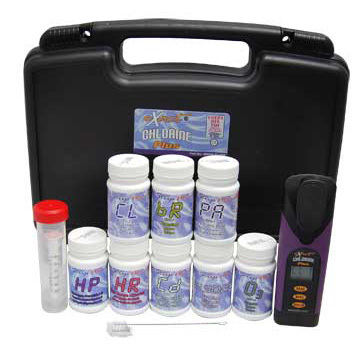 At this time we carry 100 packs of DPD-1, DPD-3 and DPD-4 in the Water Testing Blog Test Kit Store. Differences between DPD-1, 3 and 4? For the answer to that question, we suggest that you take a look back at one of our earlier postings called What is DPD?. Not to brag, but we think that article does a decent job of answering the question. DPD-1 — Used by itself in a water sample to determine the free chlorine concentration in the sample. DPD-3 — Used after DPD-1 in a water sample to determine the sample’s total chlorine concentration. DPD-4 — Used by itself in a water sample to determine the total chlorine concentration in the sample. So, before purchasing DPD, you may want to verify the type of chlorine testing that you will need to do — else run the risk of accidentally purchasing the incorrect DPD reagent(s)! 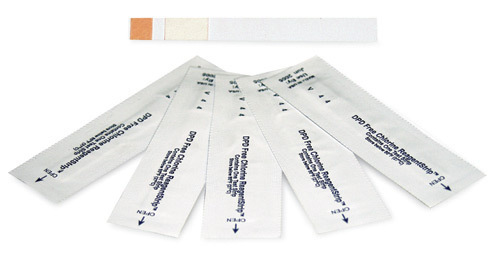 As we stated earlier, you can purchase 100-packs of DPD-1, DPD-3 and DPD-4 from our Water Test Kit Store. As for where to find other forms of DPD reagents, at this time we know of places to purchase two other forms of DPD: tablets and powder. Need a new meter to test chlorine levels, too? We suggest looking at the eXact Chlorine Photometer available on the FilterWater.Com web site. It offers the reliability of DPD-based chlorine testing and the convenience of not having to match colors against a color chart. Want accurate chlorine test results but don’t want to deal with DPD reagents and meters? Take a look at the SenSafe Free Chlorine water Check product currently available in our Water Test Kit Store. It bears USEPA Approval for use in municipal water testing and offers superior resistance to monochloramine interference that can sometimes affect the results obtained when testing for free chlorine residual using DPD test reagents. « Half of Students Cannot Identify the Atoms in Water — Scary!